Is it not awesome that I am still in this weigh in and healthy lifestyle blogging? I am so proud of myself this morning and my Wednesday weigh in and blogging about it had not faltered for a moment. Consistency is a key to success, keep moving even when sometimes you take some wrong turns [of course its because you are conscious is the reason you even know you have taken a wrong turn], keep moving by turning back into the right direction. Do not stand there kicking or blaming yourself for the wrong turn and not doing anything about it. Today we want to understand more about success and how you need to get yourself ready for it. Last post dwelt on what our plans, goals and resolutions are in 2017 [I believe you have written them down], now we are to be optimistic and enter into the level of imagination on what our successes will be like this year. What successes are you looking forward to? You will need to imagine yourself in YOUR successes and I believe it will help to move and plan in the right direction. I just read a book “Who Moved My Cheese” by Dr. Spencer Johnson [you need to read it], and the little men in the book Hem and Haw were great examples of what we could all be as we journey through life reacting to the changes that occur around us. I saw the Hem in me but I loved that Haw is what I desire to be, and one of the tools he used was to tune on his power of imagination when he plunged into the unknown. He imagined himself succeeding in the new venture and this in turn spurred him to run faster and look out more for opportunities. Haw placed himself where success will meet him, he placed himself where he wouldn’t waste opportunities when it eventually appeared, he already planned what to do with ‘success’ when it eventually showed up, he set himself up for success. If you set yourself up for success anything is possible. How I decide to set myself up for success in 2017 fitness journey. 1. I imagine myself at the top. It is not difficult for me because this is what I had always done since my teenage days and mind you, it had worked for me except many that were divinely altered, lol I think I got a good deal from my imagination. 2. Be positive: Never say Never, you can do it! The top of the ladder is made just for you; you are not part of the relegation team. Positivity is an attitude and you need to develop this, you need to sharpen your mind towards the words of Paul that says “I can do all things through Christ who strengthens me”. When you are exercising and that thought, ‘just stop now you are tired’ drops, tell that thought ‘I don’t stop when I am tired, I stop when I AM DONE’. Yessssss, we won. 3. Plan and Prepare: I said that in the last post, but be detailed in your planning. I mean, make sure you put it down in writing; the how, the when, the where, the what and the whose. Don’t just desire to do 20 pushups successfully but how do you get there? Research, read blogs and try your best. Would you believe if I told you that perfecting dumbbell chest press will enable you to push up without stress? I read it and I tried it and it worked effortlessly. You want to try intermittent fasting, you can start by pushing your breakfast just 30 minutes daily till you get to your desired fasting window. You want to eat more veggies in 2017, buy what's in season and keep it where you will see it daily. Stop avoiding foods, start adding the healthier versions very soon the bad ones will give way. 4. Get ready for success: Stop reeling in the past, either past failures, mistakes or even a past success. Some of us [terribly guilty of this], keep wearing the same clothing even when it had become baggy. I think we derive a form of gratification when our clothes keep dropping off our shoulders and waists, (truly it's a mark of measurement and success) but mind you it could be bad for success in the long run especially when we become addicted. Keep fresh wardrobe or better still adjust it if possible so that you are indirectly telling that status that you won’t be back. Why do we lose weight and desire to add weight again for any reason. 5. Celebrate the little milestones. You aim to run 5k in 30 minutes but you still run in 50 minutes, be proud yourself so that you won't push yourself to injury. It works this way, if you don't celebrate the so called little successes, when the expected one comes you won't even acknowledge it and soon you are pushed off limits and that is bad for business. 6. What had worked in the past? The weight-loss success you had in the past, ask yourself what you did to achieve it. I think it's time to go back to it, was it tracking everything you ate? Was it consistent exercise? For me I know that when I exercise more than 250 minutes on a weekly basis consistently, I will lose weight. So, you would need to do such analysis and many more so that success is faster and grand. 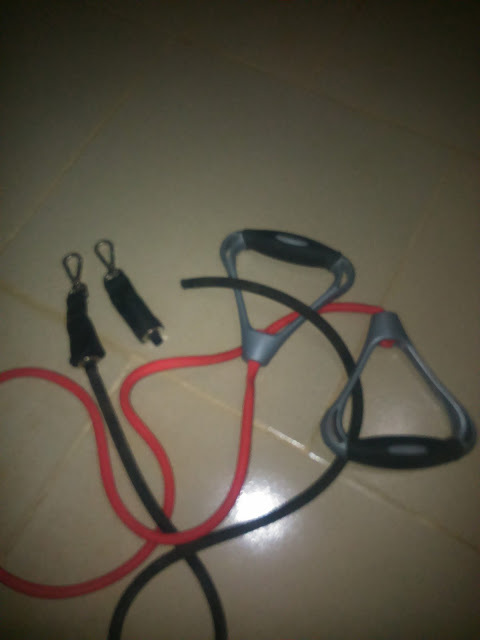 Well in the spirit of reviewing past efforts, I decided to use my honorable dust-infested resistance bands [needed for the next exercise video] and as I was pulling and stretching, "ppraah" I heard the band snapped and cut, that was the result of lack of use. I challenge you as you succeed this year in leading a healthy and fit life, what are those tools, ideas, books and equipment that had gathered dust in your house, clean it up and use NOW or else... I don't want another "Ppraah". There is a local adage that says, "if you pray for rain and you don't make provision for containers for storage, you should be ready for a flood". I weighed in at 169lbs yesterday.